In this award-winning homeschool elementary science curriculum, Exploring Creation with Botany presents a scientifically sound and God-honoring study of botany for grades K-6. Content covered includes the nature of botany and the process of classifying plants. It then discusses the development of plants from seeds, the reproduction processes in plants, the way plants make their food, and how plants get their water and nutrients and distribute them throughout the body of the plant. TO VIEW SAMPLE LESSONS AND ANY AVAILABLE PRODUCT INFORMATION IN PDF FORMAT, PLEASE SEE THE DOWNLOAD SAMPLES AT THE BOTTOM OF THIS PAGE. This book begins with a lesson on the nature of botany and the process of classifying plants. It then discusses the development of plants from seeds, the reproduction processes in plants, the way plants make their food, and how plants get their water and nutrients and distribute them throughout the body of the plant. As students study these topics, they also learn about many different kinds of plants in creation and where they belong in the plant classification system. The activities and projects use easy-to-find household items and truly make the lessons come alive! They include making a “light hut” in which to grow plants, dissection of a bean seed, growing seeds in plastic bags to watch the germination process, making a leaf skeleton, observing how plants grow towards light, measuring transpiration, forcing bulbs to grow out of season, and forcing pine cones to open and close. We recommend that you spend the entire school year covering this book, devoting approximately two sessions per week to the course. Please note that many of the activities and projects in this book are long-term with results that can take several days to observe. Thus, you will have to be flexible in how you schedule your time. If you are a co-op leader or teacher, you might be interested in a "teacher's guide" that has been written by Mrs. Fulbright to accompany this course. The guide is currently being offered only in e-book form, but you are free to print it out after you download it. To see a sample and table of contents for this guide click here. Young Explorers author, Jeannie Fulbright, discusses the immersion approach to learning. 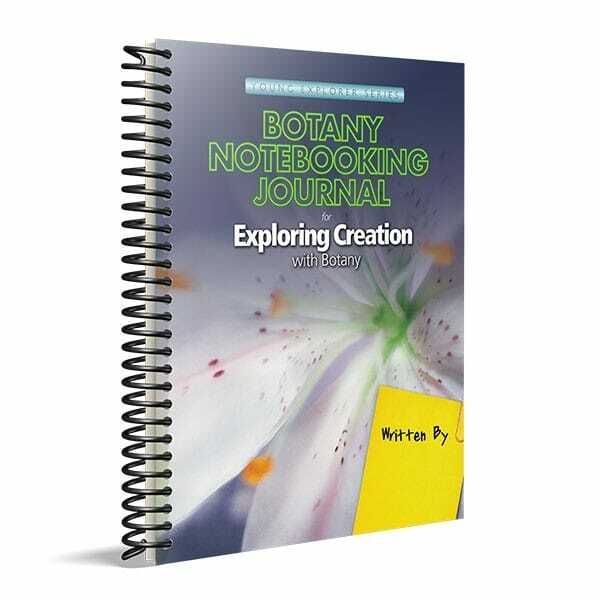 The activities in this notebooking journal provide everything your child needs to complete the assignments in Exploring Creation with Botany. In addition to a suggested lesson schedule, it serves as your child's individual notebook and provides a place for them to complete every assignment, record their experiments, and display their work.